Two sides of premium foam in one awesome polishing and waxing applicator! 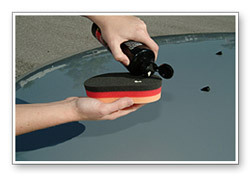 The Wolfgang German Polish 'N Wax Applicator has two sides of specialized foam to polish and wax your vehicle to perfection. 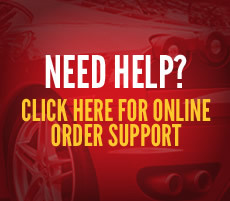 You can give your vehicle an unbelievable shine using just one applicator. Cutting foam on one side levels swirls while the soft finishing foam applies even, neat coats of wax. The Wolfgang German Polish 'N Wax Applicator is the ultimate hand applicator! How many applicators does it take to detail a vehicle? 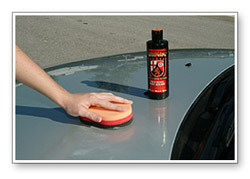 If you have the Wolfgang German Polish N' Wax Applicator, it only takes one. Two sides of specialized foam enable you to polish and wax your vehicle's paint using the same applicator! The Polish N' Wax is a triple layered foam pad with orange light cutting foam on one side and soft, gray finishing foam on the other side. The red layer in the middle gives the pad additional height so you can grip it without rubbing your fingers on the paint. The pad is oval for comfortable gripping, and it is larger than the average applicator pad so you cover more area in less time. 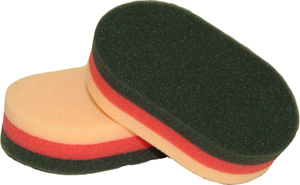 The Polish N' Wax is made out of the same quality foam as our other Wolfgang pads. Wash and reuse it time and time again. It replaces at least two applicators, but probably more because it is built to last much longer than disposable wax applicators. Once you use the Wolfgang Polish N' Wax German Applicator, you'll wonder how you ever did without it! This pad is twice as big and twice as useful as your average applicator, and it makes hand-detailing much more effective. Apply Wax or polish onto pad. Polish surface in a circular motion. Important: Always wash your Polish N' Wax applicator thoroughly with Snappy Clean before storing or reusing. Allow it to air dry and it will be as good as new! The dimensions are 6" l x 3 ¾" w x 1 ½" h.
Each Packaged Includes 2 Pads.